Yarrangobilly Caves are located within Kosciuszko National Park, 6.5km off the Snowy Mountains Highway, 77km from Tumut. Forming over thousands of years, this string of limestone caves features many stunning decorations, including delicate shawls, grand columns, underground pools, and awesome chambers. Yarrangobilly also has a natural thermal pool which is a constant 27 degrees celsius, so bring your bathers as well as your walking shoes. Guided and self guided tours are available daily, and special torchlight tours can be arranged by request. Four caves are regularly open for inspection – The South Glory Cave for self guided tours, the Jersey, Jillabenan and North Glory Caves for guided tours. The Castle and Harrie Wood Caves are opened for special discovery tours and by appointment. 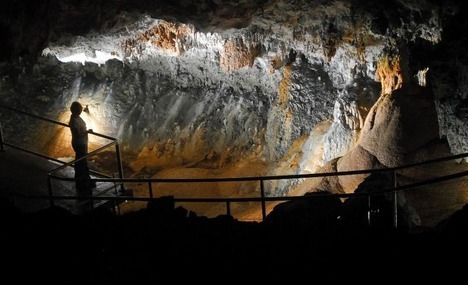 Tickets are required for all cave visits and are available from the Visitors’ Centre. 9am to 5pm Daily (subject to winter road conditions) Closed on Christmas Day.